Sorry for lateness people. Had a terrible night sleep coupled with early morning meeting- if i had slept better I wonder if I would have dreamed up these curtains? What do you think of the frilly bit at the top? Overall I love the leather and B&W combo- of course! Hope your Tuesday is going well! The wonderful Apartment Therapy has is launching the Small Cool Contest again. If you are not familiar with the concept they invite submissions from different size categories (Teeny Tiny, Tiny, Little, Small and International) and readers vote on the best use of space. Such a brilliant concept and the rooms and ideas never cease to amaze. I will be most likley following the voting and sharing some clever cat ideas as they come through. I am especially impressed with the calming effect of this lovely curtain covered storage unit. Space to boot and minimalist lines when it is all closed up. Wonderlust! Do we have any Australians keen to enter this year?? Please let me know if so…..I will be sure to vote! Ok, Sydney I have had it with rain already. 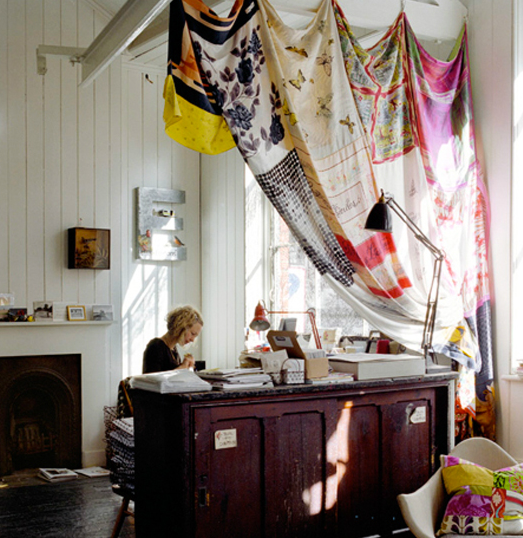 I want summer dresses and warm sunshine and a curtain made from scarves! I am totally obsessed with blues and turquoise and navy and piping. So to find them all in the same image is heaven. Diane Bergeron’s home was featured in Vogue Living a while ago (so this is not the first time I have seen this image) and for readers of the mag I am sure you will not forget this breathtaking space. I WANT NEED MUST HAVE this wallpaper! Yesterday was cold cold cold in Sydney. Seriously this weather has to pick up because I am not sure how long I can allow myself a “treat” because it is cold.My office has erupted into a sea of cupcakes, mint slices, croissants, cinnamon toasts and cups of hot chocolate- all because ‘it’s cold’. Not a great idea for the waistline. If I was sitting somewhere like this and enjoying the moment in a twinset it would be worth it but mindless office munching must end- pronto. Who could ignore something that is such a great use of space- one could have a put an armchair and a side table or an afternoon tea spot for five. This is the perfect solution for mini sized homes these days- where do you create a sense of drama if you don’t have the luxury of a formal living space??? Here! 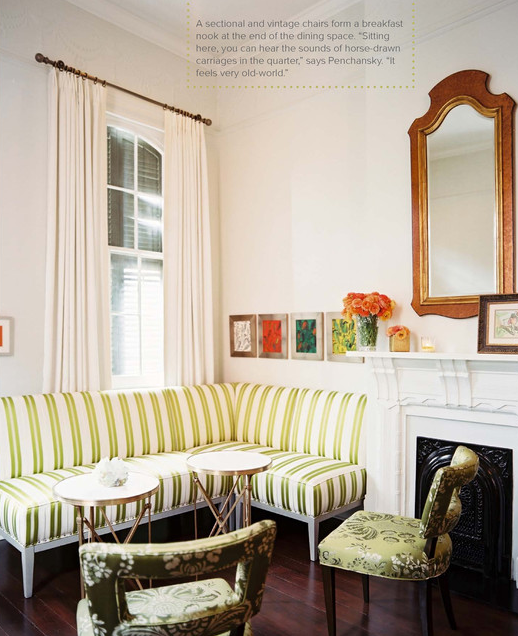 I love the use of contrasting fabric on the chairs and the bold stripes on the upholstery. The colour and pattern combinations are endless so don’t be boring. Mix dainty with bold, stripes with florals, brights with neutrals. This is one place I would not advocate cushions- keep it clean. Are the tables too small for trays of scones? Maybe. If you are keen to expand the table top surface area look for a glass top table with similar finishes or even a modern perspex looking table would blend well. PS please don’t ignore the perfect drapery in this shot- I may be an advocate for booths but I am about to get really big on window dressing- curtains are like a Hermes belt- expensive, not really necessary for their intended function BUT incredibly beautiful and important and creating a space that screams money and a designer eye. Blank walls at times are delicious. Simple and timeless. 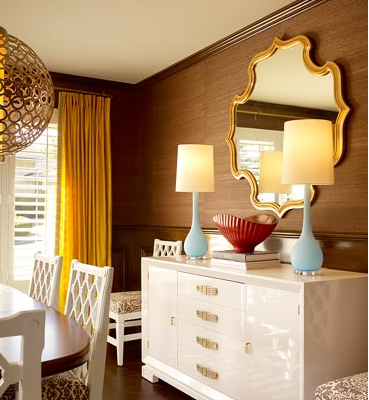 Other times you want something that looks layered, whimsical, full of character! 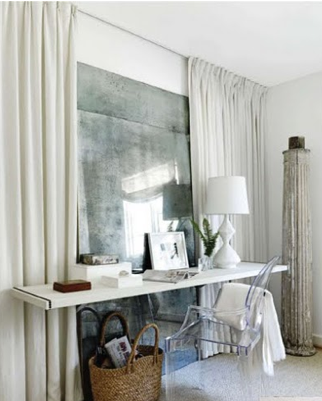 Layer a console, a mirror (to the ground) and a curtains over a non-existent window- voila. Yesterday I shared the idea of the small coffee table for small space. If I had already seen this photo I would I have posted it first because it wins GENIUS award. 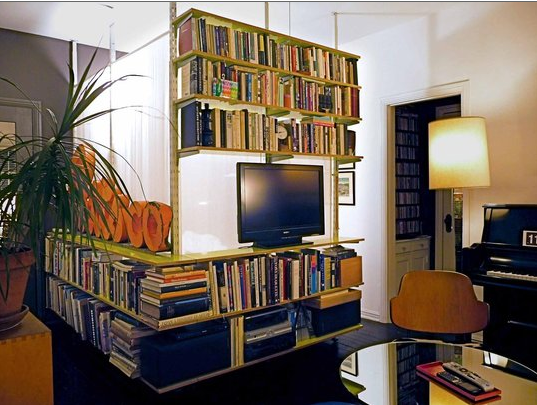 Really – you have to have a look at this clever idea, again from Apartment Therapy Small Cool Awards. Now, clever Ariel actually sleeps behind this screen or “glowing box” which I would not like to do everyday however it would be excellent for segmenting a guest bedroom, creating a nook for an office, creating a kids play area or for creating a reading den. No matter the reason this is a very clever and affordable way to create a space that looks great, creates a soft light and hides whatever you do not wants others to see- all good things if you ask me. Note the reflective coffee table which is great for small space and Ariel makes mention that she added mirror panels to all the internal door- she is so smart. I have just had the most amazing weekend. Yesterday was all about culture. Brunch at Joost (great view- terrible menu and service), Annie Leibovitz exhibition (great images, poor curation), outdoor cinema (great venue, crap film). However despite my harsh reviews I enjoyed it all- you have try these things so at least you have a comment from your own experience. Getting out, trying new adventures and than bitchy about them is much better than staying at home and reading what the papers says. The name of this styling idea has been inspired by the current trend to colour the end of you hair a bright colour (so it doesn’t actually pertain to tie dying the fabric). 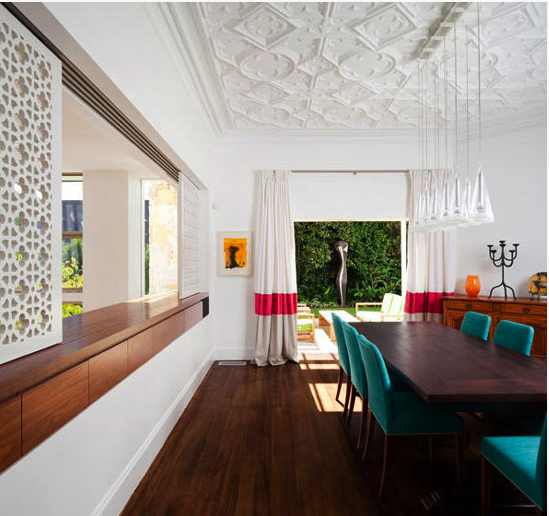 I love the use of a block colours to create a new accent in what was simply classic white curtains. 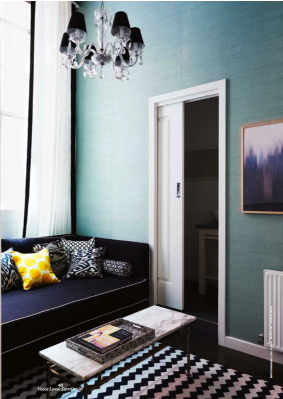 Often fabrics with a print demand too much attention – however this modern block colour version gets attention for all the right reasons and add sophistication to any space.